Hey there! Welcome back to Crafty Time 4U, today I am sharing with you my entry to the Newton's Nook Challenge. This time the challenge is about one layer cards.recently I added couple more new stamps from the Newton's Nook to my collection, which keeps growing, and I sat and thought a little bit about what I wanted to do, because I knew it could only be one layer. Newton's Nook have such fun stamp sets, that will spark your creativity, one of the newest stamps have Newton doing all sort of naughty things, that kittens usually do, so you can create, from apology type of cards to, funny cards. Heart die, and making paper. oh my gosh I love this card!! SUPER FUN! The heart hexagons embossing is AWESOME!! The sentiment couldn't be more perfect for Newton's scratch marks. This card is SPOT ON, Heidi! Amazing! This card just makes me smile! I love that crazy cat and the claw marks are fabulous. You are so clever and talented my friend! Me has hecho reir tanto con esta tarjeta!! Ya te lo puse en facebook! siento no poder comentar en el blog más a menudo, pero voy revisando eeeh! un beso! I really love this - it's so cool how you added texture to the one layer challenge and I just LOVE the claw marks going through the texture paste! What a gorgeous card! 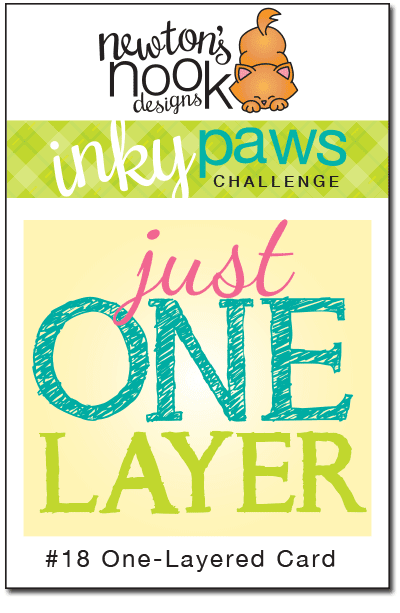 Thanks for linking up to our Inky Paws Challenge!